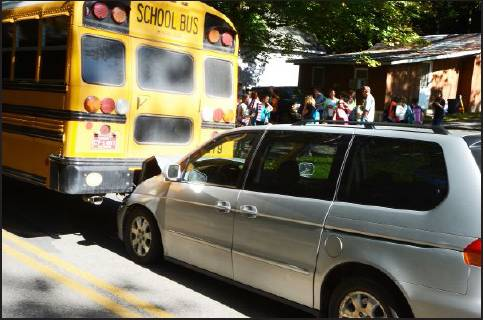 According to the Monongalia County Sheriff’s Department, two children were taken by ambulance from a Tuesday afternoon accident in which a minivan hit a school bus on Canyon Road on September 17th, 2013. The bus driver had 46 kids on board. The bus departed Mountaineer Middle School and was stopped on Canyon Road when the accident occurred. The driver said she had all of the bus’s normal caution lights on and the airbrake engaged. “I thought I dropped my transmission,” the bus driver said, describing the impact. “Then I saw a plume of smoke come up behind the bus and the kids yelled.” The van was partially lodged under the rear of the bus. The children heard a large bump and said they thought the driver had just slammed on her brakes. Those seated were not injured, but the two children who were injured were standing at the time of the impact. No citations were issued at the accident scene; the accident is still under investigation. The two injured children were taken to the hospital for medical evaluation, but thankfullly it seems that no one was seriously or sustained permanent injuries (although if is your child who is on the school bus, any bus accident is a serious matter). It is illegal to pass a school bus that is stopped to load or unload children. Red flashing lights and an extended stop sign arm signals to motorists that the bus is stopped and children are getting on or off the bus. In all cases, traffic behind the school bus (traveling in the same direction) must stop. It is up to us to keep the kids safe – so please be careful! Information provided by the Morgantown WV accident attorneys at the Robinette Legal Group, PLLC. Prevention is always better than the cure. Look alert for school buses and pedestrians, and let’s work together to prevent accidents. If you have a question about accidents, call us today at 304-594-1800 or after hours 304-216-6695.